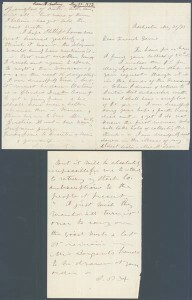 Autograph Letter Signed twice, initials, at the conclusion of the letter and after the postscript, five pages, octavo, Rochester, New York, May 31, 1873. To Mrs. Davis, who was apparently acting as treasurer of the National Woman Suffrage Association; she had become discouraged with the suffrage cause and was considering resignation. Susan B Anthony writes two and a half weeks before her landmark trial that paved the way for woman suffrage some fifty years later, with the passage of the Nineteenth Amendment in 1920. She expresses her great anxiety over the uncertainties of the outcome of the trial, yet she is not deterred by its weight as she forges ahead with the demands of her speaking tour and fundraising to support the effort for women’s emancipation. On June 17 and 18, 1873, Anthony would be tried in court for illegally voting the previous November. That event and the trial that followed created an opportunity for Anthony to make known her arguments for woman suffrage to a wider audience than ever before. 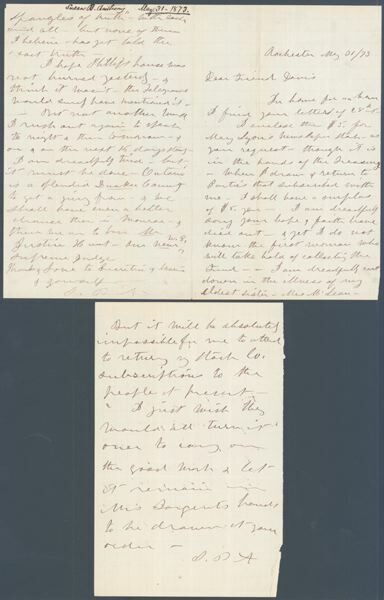 Susan B Anthony writes: “I’m home for an hour to find your letter of 28th. I enclose the $5 for Mary Lyon’s newspaper start?as you request?though it is in the hands of the Treasury. When I draw & return to Parties that subscribed with me, I shall have a surplus of $5 [for] you. I am dreadfully sorry your hope & faith have died out?& yet I do not know the first woman who will take hold of collecting the Fund. “I am dreadfully cut down in the illness of my eldest sister, Mrs. McLean. She is now in New Jersey?her husband with her?in the hope that change & travel may bring her relief?but thus far the reports are discouraging?her cough increased rather than lessened & her strength not added to. I want to go West with her at once?but this terrible U.S. prosecution chains me here until after June 16th and I am speaking again every night to that date in Ontario County. Mrs. Gage begins tonight at Clifton Springs & speaks to date of trial. I cannot move Mrs. Stanton to help?not even in the Canandaigua Convention the 16th in which I did hope to have her?but she says her place is at home. All her boys are now there?& girls will soon be. I do hope the trial will be had this time. It is very annoying to be kept thus twixt heaven & earth?not knowing when & where you may rest your foot. “Thanks to your dear mother for the $15. It shall be sacredly appropriated to help emancipate woman, as I have always tried to appropriate every dollar ever entrusted to me to help on the good work. The telegraph dispatches bring the Beecher, Bowen, Tilton pledge of April 1872. What an opening up of windows it is to the public. I tell you it is altogether the best thing to let that disease have its natural course?if it is rather tedious. I have never felt it my place or duty to interfere with them?they are each & all not wholly reliable?the revealer and the revealed alike. As Beecher said to a friend?there are ‘specks and spangles of truth’?with each and all?but none of them I believe?has yet told the exact truth. I hope Phillips house was not burned yesterday?I think it wasn’t?the Telegrams would surely have mention it?But not another word. The 1872 presidential election occurred on November 5. That day, Susan B. Anthony, in demanding for women the same civil and political rights extended to male blacks under the Fourteenth and Fifteenth amendments, led a group of fourteen women to the polls in her hometown of Rochester, New York to test the right of women to vote. She and the women succeeded in voting by threatening the registrars with a lawsuit if they were turned away. Two weeks later, on November 28, she and the women, and the inspectors who had registered them, were arrested. Bail was set at $500, and all but Anthony elected to pay it rather than face jail. Her attorney, Henry R. Selden, arranged for Anthony’s release until her trial. On January 21, 1873, U.S. district judge Nathan Hall reset her bail at $1,000. When Anthony again refused to pay her bail, Selden paid it, rather than ‘see a lady I respected put in jail.’ While awaiting trial, Anthony seized the opportunity to educate the citizens of Rochester and surrounding counties on the issue of woman suffrage. She took to a highly-publicized campaign, speaking in town after town on the topic, ‘Is it a Crime for a Citizen of the United States to Vote?’ By mid-May, Anthony’s exhausting lecture tour had taken her to every one of the twenty-nine postal districts in Monroe County. Her tour worried prosecutor Richard Crowley, who convinced U.S. Supreme Court justice Ward Hunt (who would hear her case) that Anthony had prejudiced potential jurors. Hunt agreed to move the trial out of Monroe County to Canandaigua, the county seat of Ontario County. A new trial date of June 17 was also set. Anthony responded to the judge’s move by immediately launching a lecture tour in Ontario County. She spoke for twenty-one days straight, finally concluding her tour in Canandaigua on the eve of her trial. On June 17 and 18, Susan B Anthony was tried and convicted of violating the voting laws. In her diary for June 18, she angrily described the trial as ‘the greatest judicial outrage history has ever recorded! We were convicted before we had a hearing and the trial was a mere farce.’ A request for a new trial was denied on grounds that Anthony’s constitutional right to a trial by jury had been violated, but Hunt denied the motion. A fine of $100 plus the costs of the prosecution was ordered, which Anthony successfully refused to pay. The loss of her case convinced Anthony that women could not win the vote through the courts and that she must turn instead to the legislatures of the people directly. From then on she campaigned tirelessly for a federal woman suffrage amendment through the National Woman Suffrage Association and the National American Woman Suffrage Association and by lecturing throughout the country and in the western territories. Anthony died in 1906, and the national enfranchisement of American women was eventually achieved fourteen years later with the Nineteenth Amendment [Sources: Encyclopedia of Women’s History and “The Trial of Susan B. Anthony for Illegal Voting” by Douglas Linder]. Among the individuals discussed in Susan B Anthony’s letter are the following: Mrs. Stanton is Elizabeth Cady Stanton, who, in 1848, formulated the first organized demand for woman suffrage in the United States. Lucretia is possibly Lucretia Mott, co-organizer of the first women’s rights convention in the United States in 1848 and longtime suffrage supporter. Mrs. Sargent is Ellen Clark Sargent, the first person to propose a women’s suffrage amendment to the U.S. Constitution. Mary Lyon was a pioneer of women’s higher education; the small contribution that Anthony made to her publication was necessitated by the depleted state of their funds. The Beecher-Tilton matter was a scandal that erupted in 1872, when women’s rights advocate Victoria Woodhull published an article accusing Henry Ward Beecher, a well-known and widely popular clergyman, of adultery. It was charged that he had an affair with a congregant, Elizabeth Tilton, wife of Theodore Tilton, his former friend, literary protÈgÈ, and editor of the journal Independent. Two ecclesiastical tribunals exonerated Beecher, though the jury in the civil suit failed to reach agreement, as have later students of the evidence. Despite the scandal, however, Beecher remained active and influential until his death.